The World Business Council for Sustainable Development (WBCSD) and its partners have an ambition to reduce greenhouse gas (GHG) emissions from agriculture and land use change by 50% and make 50% more nutritious food available by 2030 (including by reducing food loss and waste), while strengthening the climate resilience of agricultural landscapes and farming communities. Companies must accelerate progress to meet these ambitions, but measurement of progress has been limited by the availability of data, particularly on upstream and downstream GHG emissions in supply chains, climate resilience and food loss and waste. To address these gaps, WBCSD and CCAFS convened a workshop at the University of Vermont, in partnership with the International Center for Tropical Agriculture (CIAT), World Resources Institute (WRI) and PricewaterhouseCoopers (PwC). This info note captures the key lessons which emerged from the workshop. Dinesh D, Verhage F, Bennell D, Bonilla-Findji O, Richards M, Robertson K, Siantonas T, Somogyi D, Stephenson J. 2018. 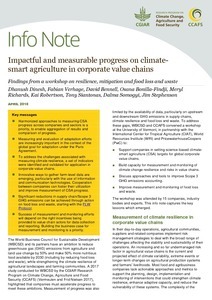 Impactful and measurable progress on climate-smart agriculture in corporate value chains. CCAFS Info note. Wageningen, Netherlands: CGIAR Research Program on Climate Change, Agriculture and Food Security (CCAFS).